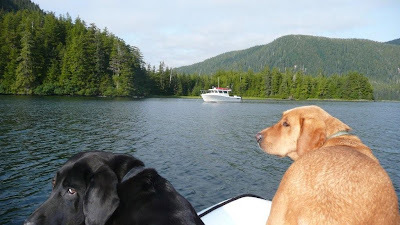 33' to Alaska: Sunday, July 12, DeGroff Bay (Just North of Sitka) – A Golden Day! Sunday, July 12, DeGroff Bay (Just North of Sitka) – A Golden Day! We woke up in our beautiful Klag Bay anchorage to a nice, sunny, warm day. Hallelujah! We all jumped in the dinghy and putted along through Klag Bay until we found the gold mine ruins. 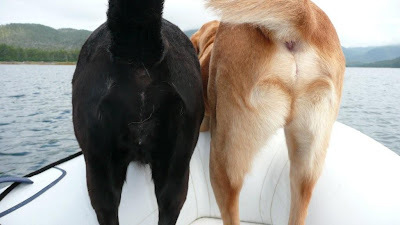 Here is a typical view from the dinghy captain's chair... The gold mine was was much more dilapidated than we expected. It must have been abandoned in the 30’s or 40’s. The old engines looked quite primitive. 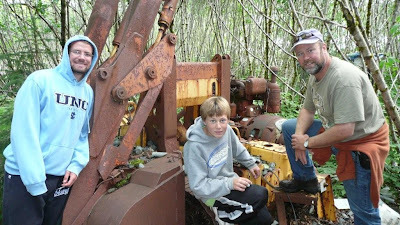 We did find some of the old ore cars and the kiln where they melted the gold. The rest was just fallen down old buildings, rusted pipes, etc. It was all very interesting but we didn’t find any gold. Nutz! It was great to get out and walk around in the warm sun. We got back to the boat at lunch time and fried up the fish we caught yesterday and then set sail. I had expected the westerlies to be blowing up the open ocean but when we got out there, it wasn’t too bad at all. We tried to fish but the swells rocked the boat just enough to throw everyone but me off kilter. Within minutes, Mom couldn’t stand up so she went to go lie down. Cody was laying on the back deck gasping for fresh air (like the fish I never caught) and Connor dove into bed. I, on the other hand, was the only one ready to fish, but avoiding mutiny, I cranked up the equipment and gave up…there’s no salmon in Alaska anyway! Tomorrow is Monday and we’ll head into Sitka for communications, supplies, fuel, and water. Cody is ready for civilization and Mom needs fresh veggies but I’d like to stay out in the wilderness. I’m going to ask her to pickle up some kelp slices…then maybe we won’t need as many fresh veggies?!?! I guess I better go wash the salt off the windows now. It’s just too beautiful outside to not maximize our views.